have a visit at the data box link given on the right as well. 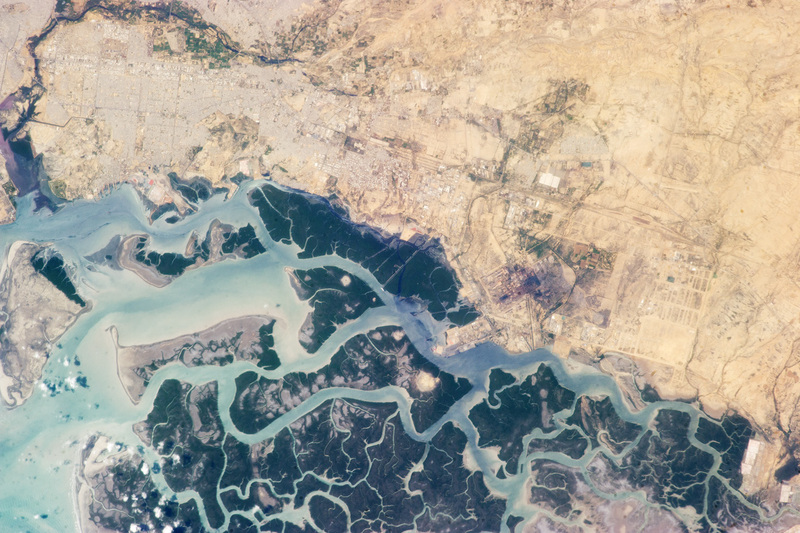 On 20 April 2013, a team of astronauts from the International Space Station focused their Nikon D3S digital camera with a 400 millimeter lens on Karachi and highlighted the contrast between the highly urbanized and industrialized Korangi and the dense green mangrove forests and waterways of the Indus River Delta to the south. Away from the river delta, vegetation cover disappears rapidly to the northeast. To the north and west, Korangi Town is bordered by the Malir, one of two rivers that pass through the Karachi metropolitan area (the other is the Lyari, not shown). The river course of the Malir is marked by green riparian vegetation, which stands out vividly against the surrounding gray to tan urban areas. Critique on "Master plan for Multan 2008-2028"
Multan Development Authority, Multan (MDA) is inviting comments on its draft report for the proposed master plan of MDA controlled area. The final report of the 'Master plan for Multan 2008-2028' is available online for review and comments in 3 different files Here. the Authority has invited comments on their email link shared in their recent advertisement, in the Daily Pakistan, dated 8 May 2013, page_. I copy their advertisement below which has been copied from the post by a planner in the facebook 'Planner's Corner' Page. Here is my short critique after having a general review of the document. You are encouraged to comment on it and share your views. 2. Spatial and pictorial character of work is somehow under represented in the report, I understand that this would have been well worked, but could not be presented sufficiently. For example, section 1.1.2 Historical and Architectural Heritage" explains important buildings without any image and more importantly without picturing their existing condition, critical physical starte and potential threats / conservation needs. A picture is worth thousand words but generally master plan document does not present existing conditions pictorially. 3. "Multan Master Plan" is essentially a Master Plan for the city or area controlled by MDA. It does not include rural areas, so this boundary focus should be outlined and given the name "Multan Urban Area Master Plan" or "Multan MDA Area Master Plan" If there are no differences between urban and rural areas in the study area, then the why "Table 2.10: Population Forecasts for Urban Settlements" specifies 'urban' settlements. 5. Section 12.14.2 "Public transport" existing transport routes can be given on the map on page 12-61 and the 'gap' should be identified which will guide the 'Proposed' transport routes. 6. Investment on road construction should also consider the need for creating bus stops and walking infrastructure safe for women and children, school goers. 7. Encroachments removal is important but realistic plans should indicate their spatial adjustment and management. There can be an alternative strartegy: to live with encroachment, the planners should think on it too. creating an urban place both for the users, movers and the residents all. Certainly we are currently 'living with encroachments' and we want to get rid of them too. Can't we accept them in some 'way' within the framework of master plan?? urban planning cannot end public's practice of encroachment, it should improve it and utilze it in the best way, but the plan does not make attempt to manage the encroachments in city gateways and grave yards using city management practices and relies on demolishing or conservation plan.